Sally practices orthopedic physical therapy and treats a wide variety of orthopedic conditions, including conditions affecting the back and neck, hip, shoulder, knee, elbow, foot and ankle. 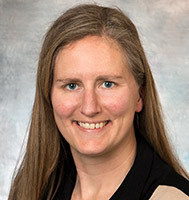 She is board certified by the American Board of Physical Therapy Specialties as a clinical specialist in geriatrics. Sally has a strong interest in screening and treatment of fall prevention. She sees patients upon referral and through Physical Therapy Direct Access (self-referral).